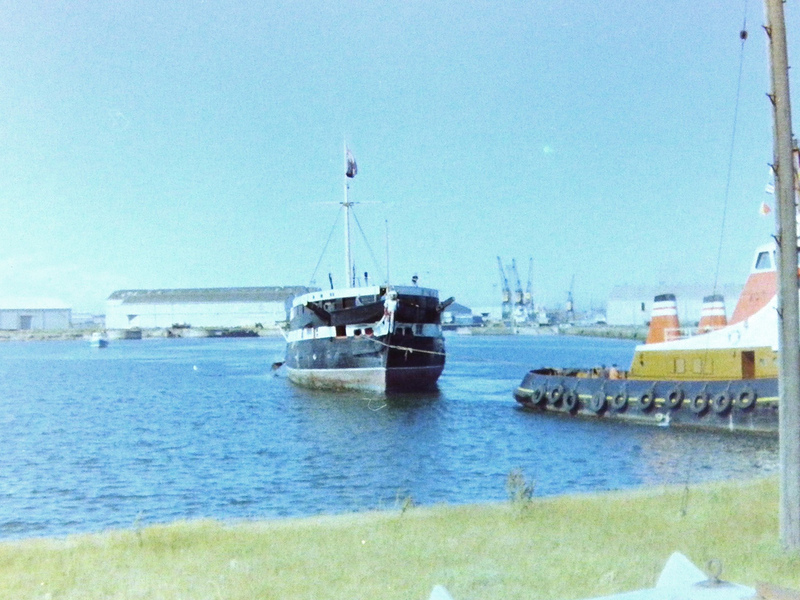 In July 1987 Trincomalee, still called the TS Foudroyant, was transported to Hartlepool by a special chartered barge. 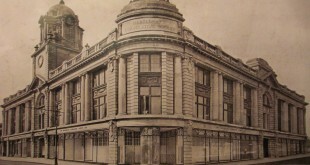 The Foudroyant Trust, with the aid of cash from Hampshire County Council, had commissioned a study regarding the best option for the ship’s future. Hartlepool was selected on the strength of the impressive restoration of HMS Warrior 1860, the Royal Navy’s first ironclad currently on display in Portsmouth. 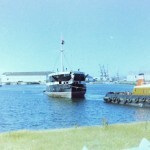 The transporting of Trincomalee’s hulk by the giant barge depleted the Trust’s funding, now almost completely exhausted. HMS Trincomalee is the oldest British warship afloat, Nelson’s flagship HMS Victory is 52 years older but that grand old ship is in dry dock in Portsmouth. The oldest commissioned warship afloat is the USS Constitution, but that veteran of the war of 1812 is only 20 years older than HMS Trincomalee. So its clear that HMS Trincomalee is something special! The news that the ship would be coming to Hartlepool was first announced in the Evening Gazette in April 1987. The reason given was due to the fantastic work that had been achieved in Hartlepool with HMS Warrior the Victorian battleship, which was just completing its restoration at the time. A highly skilled local team had been working on HMS Warrior and the same team was to be retained for work on the new project. 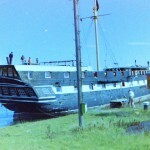 On July 28, 1987 the Evening Gazette announced, ” The only surviving Royal Navy frigate from the Napoleonic era, the second oldest ship afloat, came piggy back into the Tees today.” The ship had arrived on the colossal Goliath Pacific semi-submersible barge, which had carried the Foudroyant, as she was still referred to, all the way from Portsmouth. 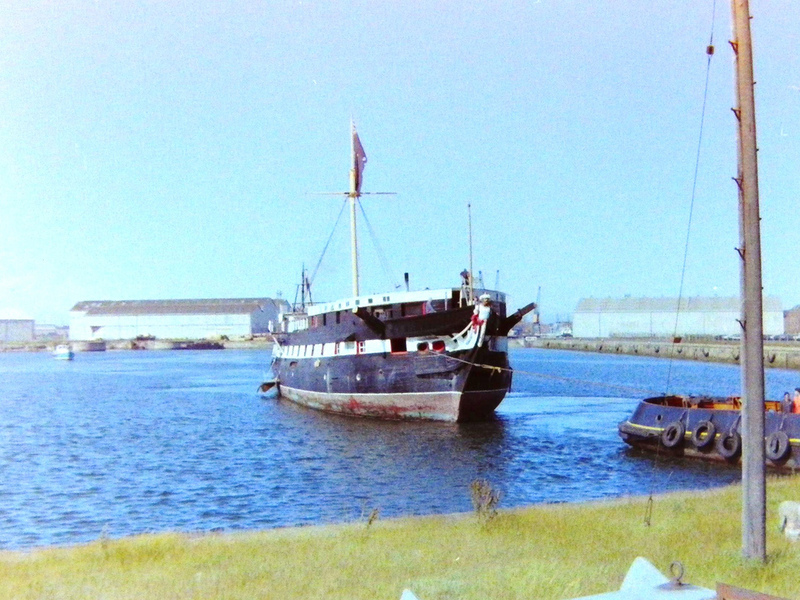 The Foudroyant arrived on the Tees the very day that the HMS Warrior opened to the public in Portsmouth. 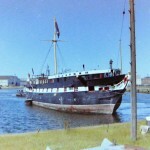 The elderly frigate floated into Hartlepool on July 30, 1987 to begin its restoration. In August 1988 a near disaster struck when fire broke out onboard the vessel, however the fire brigade quickly dealt with the blaze which had damaged a limited area of woodwork in the stern quarter. The fire was most likely caused by an electrical fault. 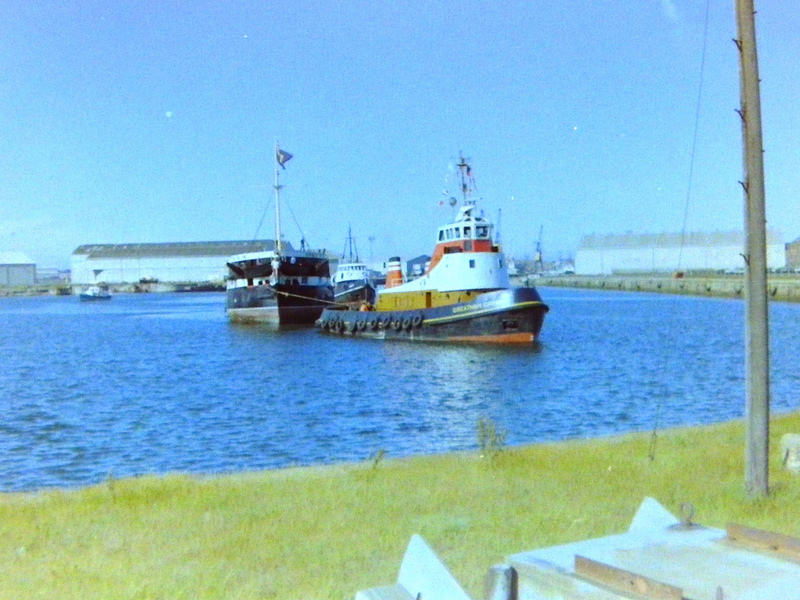 Better news followed in December 1989 when it was announced that the ship would be staying in Hartlepool as the centrepiece of the new Marina, once the restoration was complete. The original plan was for the ship to return to Portsmouth like HMS Warrior. On February 22, 1990 it was announced that the ship was to be opened to the public over the Easter break following the investment of £1 million in the Foudroyant Trust by the Teesside Development Corporation in addition to the £250,000 by Hartlepool Council. Later that year disaster nearly struck again when after some very bad weather in December the ship was only just saved from sinking, rain and sea spray had poured into her during the storm and the weight of the water pushed the ship below a hole at the aft causing the sea to flood in. Firemen attended and were eventually able to save her, after efforts by workmen with two pumps failed to lower the water level. Work continued at a steady pace with the first cannons arriving to be installed on November 21, 1991 donations followed for the restoration from the National Heritage Memorial Fund and English Heritage ensuring that the work on HMS Trincomalee remained a hive of activity. In July 1992 the Duke of Edinburgh agreed to become patron of the HMS Trincomalee Trust and further grants worth £450,000 were handed over. The HMS Trincomalee project appeared to have gone remarkably smoothly despite some of the close shaves she had. The task was one of the most successful historical projects ever undertaken in our area especially when it was announced in March 1998 that a ÃÂ£3 million visitor centre would be built around the ship with shops, catering facilities, workshops and offices. 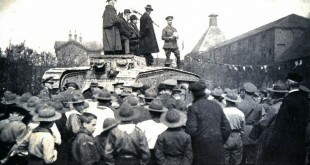 However, trouble was brewing just around the corner. The National Historic Ships Committee in London, an influential body, which compiles a register of historic vessels for what it terms its ‘Core Collection’, decided that HMS Trincomalee was not ‘eligible’. This was a heavy blow to the Trincomalee Trust and every one connected with her because this Committee’s decision carried a lot of weight in historical ships circles. Other ships in the ‘Core Collection’ included HMS Victory, HMS Belfast and Cutty Sark, but it would not include HMS Trincomalee. This was despite the Duke of Edinburgh, Admiral of The Fleet being patron of the Trust, despite the ship being built for and serving for decades in the Royal Navy and most of all despite all the hard work and money spent on her restoration. 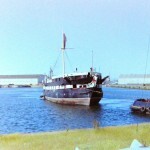 But a spokesman for the National Historic Ships Committee was adamant and defended the decision, “Despite meeting a number of the requirements to get on the list she wasn’t built in the UK, if we included the Trincomalee we would have to look worldwide at all other ships not built in the UK” he said. The exclusion was seen as a massive snub to our area because the reasons for the decision did not make sense, given the historical context. HMS Trincomalee was built in Bombay, true, but she was only built there because there was not enough timber in Britain at the time as we have seen. She was designed in Britain, she was built by a British firm as a ship for the Royal Navy, she served in the Royal Navy, she was only ever crewed by the Royal Navy, she was one of a class of identical frigates built for the Royal Navy in Britain and at the time Bombay was within the British Empire, it was not in a foreign sovereign country. The reasons for the decision were spurious to say the least. Had HMS Trincomalee been the centrepiece of a Historic Quay at say, Chatham or been returned to Portsmouth as originally planned, would the same decision have been made? Anyway, there was absolute outrage at this snub coming from the other side of the Watford Gap and Captain Smith and the Trincomalee Trust in true Nelson-like style decided to take on the Committee. It took many months of argument and persuasion but eventually the Committee gave way and saw sense, deciding that HMS Trincomalee should be part of the “Core Collection”, and quite right too. On March 10, 2001 Admiral Sir Peter Abbott climbed aboard HMS Trincomalee, his visit to the vessel marked the move by the National Historic Ships Committee to officially recognise the ship as being of national maritime significance to the UK. A period of fundraising ensued. 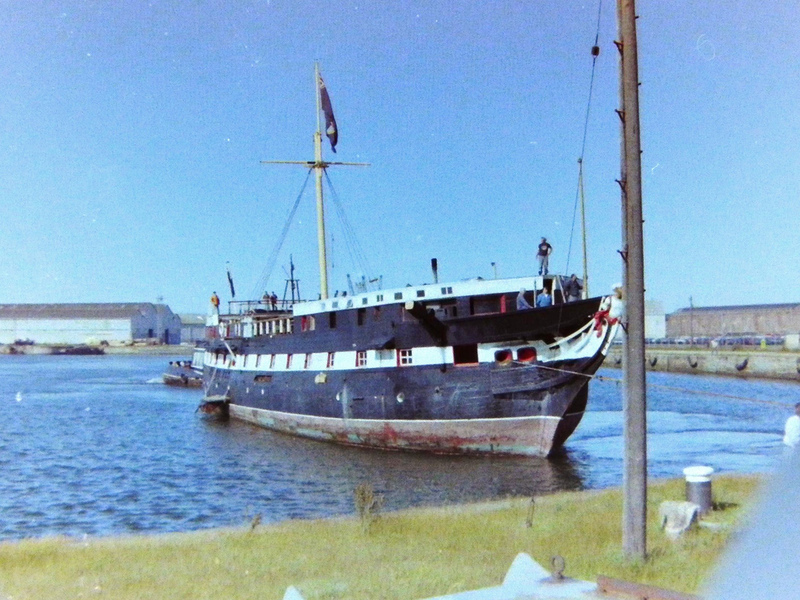 Despite opposing bids from Hampshire and Plymouth to perform the restoration, the ship remained in Hartlepool – a location she had previously occupied between 1862 and 1877! 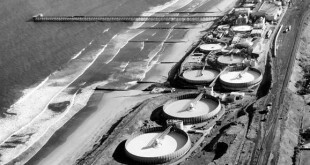 The estimated cost of restoration was £5 million, £1.5 million of which was offered between the Teesside Development Corporation and Hartlepool Borough Council. 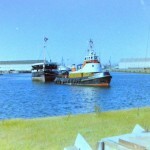 A dry-dock and permanent berth were part of the package. It was decided to restore the vessel to her original 1817 configuration, but retain some of her 1847 features out of practicality, for historic interest, and to give a more rounded feel to the ship when she became an attraction. Recruited and administered by the Trust, the restoration team’s first task was to remove the many features that had been added during her century and a quarter as a training ship. The team would eventually number 48. The superstructure above the Quarter Deck was removed completely, and the many extraneous partitions, cabins and bulkheads fitted for her training role were removed and thrown into a skip – in fact, almost fifty skips! Some 80 tons of iron ballast were removed, cleaned and stored (many were found to have genuine admiralty markings). 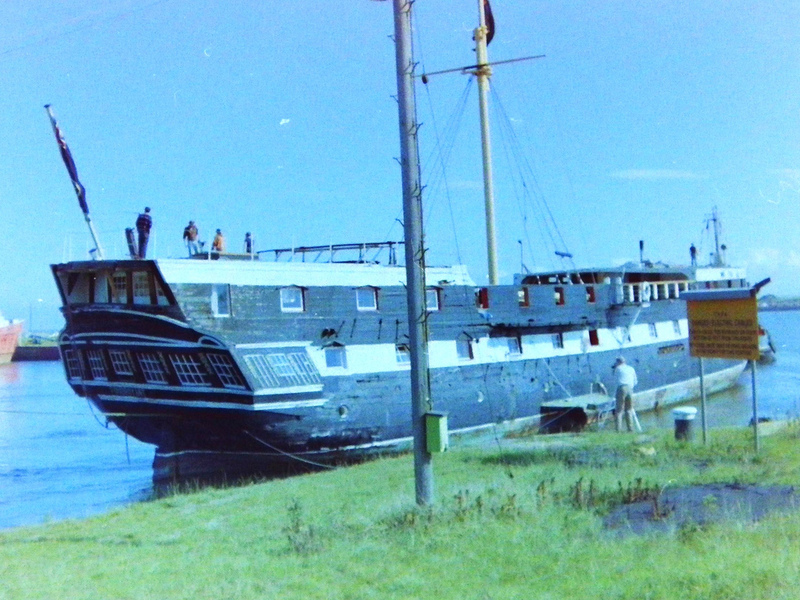 Until the hull was restored below water and made completely tight, extra pumps were fitted, along with lighting and alarms. A large steel frame structure was built around the hull to allow repairs to take place under cover, prior to the promised dry-dock being completed. Above the coppering the hull was in very poor condition due to the many alterations to the gun ports over the years, as well as rotting of the timber. 140 frames were replaced, leaving only four originals. Opepe wood was used due to its exceptional similarity to the rare and expensive Malabar teak. 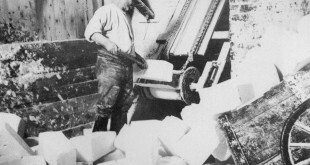 As this work proceeded the original gun port array reappeared. The Foudroyant Trust became The HMS Trincomalee Trust, and in July the name change was officially approved. HRH The Duke of Edinburgh became the Trust’s patron. The restoration continued, with the ship finally being dry-docked and recoppered, and with replica steel masts occupying the place of the wooden originals (although the change is invisible to the naked eye, especially with the dazzling rigging in place). The decks were filled with period details and items, from giant replica cannons to personal crew effects. Additionally, audio clips, some motion activated, were added to give a final sense of authenticity to the ship as it gently rolls underfoot (an effect no dry-docked ship can hope to replicate!) One of the final touches was the addition of lifts between decks for wheelchair users, a truly unique feature. Despite her extensive restoration, Trincomalee is still 65% original due to the hight quality of the Malabar Teak, which keeps well in salt water. Surviving heritage vessels of similar age have generally been built of oak and have, over the years, been completely rebuilt. HMS Trincomalee is now the focal point of Hartlepool’s Maritime Experience and it is planned that she will remain afloat in the Graving Dock. The Ship is within the Core Collection of the National Historic Ships Committee’s listing because of her exceptional importance to the maritime heritage of the UK. 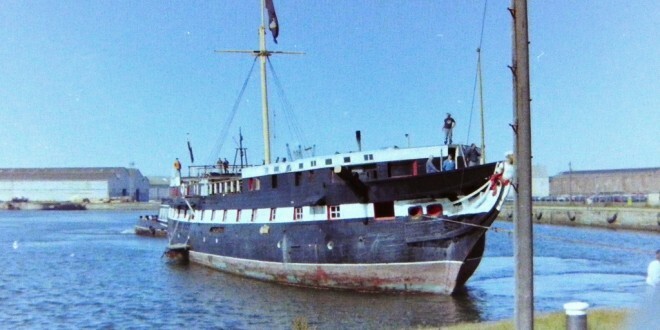 It is now incumbent upon the Trust to ensure that the vessel is maintained for the enjoyment of future generations, and this will be best achieved by applying the recommendations of the Ship’s Conservation Plan, and by retaining her as an exciting and enjoyable experience for all those who come on board.